Born September 1, 1964, in the Dominican Republic, Maria M. Trusa moved to the United States at the age of fifteen. After joining Scarsdale Medical Group (a multi-specialty physician practice serving the Westchester community since 1957) as a Medical Assistant in 1989, she was appointed as leader of the management team in 1992, and then became Executive Director in 2008. Since then she managed to transform the practice from a six-physician single-site entity with thirty-five employees to its present configuration of more than 45 physicians with four sites and over two hundred employees. 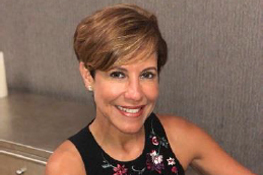 During her tenure at Scarsdale Medical Group, Maria not only set goals and drove the execution across the business around financial, operational, clinical quality, growth and team measures, but she also helped the practice achieve all established goals. As an independent strategic partner to the practice and physicians, Maria effectively identified opportunities to gain operating efficiencies, optimized workforce productivity, and became an agent of change to enhance the competitive market position of the practice. Maria demonstrates a unique capacity for tenacity and compassion in overseeing the day-to-day and long-range management of Scarsdale Medical Group. Her philosophy in introducing new employees into the Group was that their technical skills and their personality must be a “fit” for the practice. Maria believes that “An employee must be happy in order to be productive”. This principle resulted in a dedicated workforce where every employee performed not only their primary function but has been cross-trained to perform a variety of other responsibilities at the Group. In June 2005, Maria authored the report “One Medical Practice Finds EMR Will Pay for Itself in Two Years” for the Westchester Physician publication. This article described how Maria introduced cutting-edge technology at the Group with full implementation of an electronic medical record system that was implemented in 2004. Maria has also served as a private consultant to a number of medical practices for the purpose of improving their efficiency and productivity through analysis of staffing, finances, managed care contracts, management systems and vendor relationships. She provides mentoring services at Westchester Community College, and has lectured to groups on “Organizational Skills” and “Understanding Managed Health Care”. Maria has an Associates Degree in Liberal Arts from Westchester Community College and subsequently furthered her education at Pace University, majoring in Education. Maria currently resides in Tarrytown, New York with her beautiful daughter, Natasha. Maria also has two accomplished and devoted adult sons, Franco and Jeffrey. Maria readily admits that her rich cultural heritage and her nurturing family instilled in her a tireless work ethic, a thirst for knowledge, and a relentless pursuit of excellence. “I closed my chapter at Scarsdale Medical Group after 26 years in June of 2015. I joined Forme’ Medical Center and Urgent Care as their CEO and Partner in September. I was blessed to find my partner Gina Cappelli, someone who shared the same vision I had for over 15 years of helping the undeserved and uninsured community. We have been working intensively since September 2015 to create a place for our community to get access to affordable, dignified, and high-quality medical care.